Twitter and email and FaceBook run Guy and Gaz ragged (but in a good way) as they get to all that stuff you guys wanted to talk about. Nitrous Oxide, non-working Android tablets, a face-off between Siri and Microsoft’s TellMe is just the start. 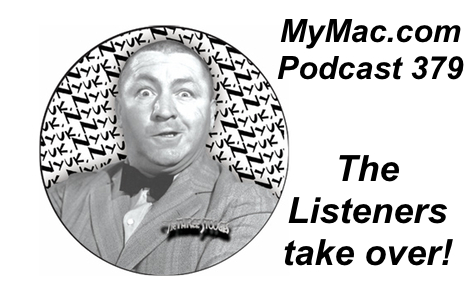 Jake Cherry wants to know more about iTunes and backing up and James Myers wants the GMen’s opinion (God knows why) on Apple Scripting, sandboxed apps, and Apple’s take on podcasting. Also a NEW segment on the show…Phobiword of the day. Please visit and check out the artists that supply great music to our podcast! Contact info: Drop us a line and let us know you want to be on the show. Gaz and Guy on Twitter, guy@mymac.com and gaz@mymac.com, or our Skype direct number 703-436-9501. Also go into iTunes and leave some feedback. Also don’t forget our FaceBook Page!